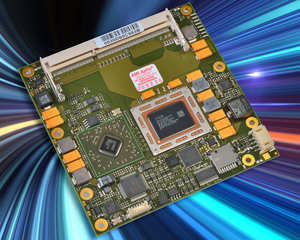 SAN BRUNO, CA -- (Marketwire) -- 12/17/12 -- MSC Embedded Inc., manufacturer of highly integrated standard board level products and customer-specific boards and systems, today introduced a powerful, new COM Express Type 6 module family. This family, called MSC C6C-A7, is based on the AMD embedded R-Series processors also known as accelerated processing units (APUs). MSC C6C-A7 members are compact form factor computer-on-modules characterized by very powerful graphics and high parallel computing performance with low power dissipation. The MSC C6C-A7 module family integrates AMD R-460L 2.0 GHz (2.8 GHz Turbo) or AMD R-452L 1.6 GHz (2.4 GHz Turbo) quad-core processors. The thermal design power (TDP) levels are 25 W and 19 W, respectively. The two dual-core versions are populated with the AMD R-260H 2.1 GHz (2.6 GHz Turbo) processor or the AMD R-252F 1.7 GHz (2.3 GHz Turbo) processor -- each featuring 17 W TDP. The processors support the AMD64 technology and the AMD-V virtualization technology. The AMD Fusion Controller Hub (FCH) A75 chipset was also selected. The main memory can be expanded to 16 GB DDR3-1600 dual-channel SDRAM via two SO DIMM sockets. The Radeon HD7000G-Series graphics engine integrated into the AMD R-Series APU, with its excellent graphics capabilities, offers support for DirectX 11, OpenGL 4.2 and OpenCL 1.1. The modules support up to four independent displays via DisplayPort 1.2 or HDMI, MPEG-2 decoding, H.264 and VCE (video compression engine). Thanks to this module family's high computing and graphics performance, the platform is especially suited for demanding applications with 3D graphics or high-definition videos and for the control of large displays such as in those found in medical technology as well as in the fields of infotainment, digital signage and gaming. With Type 6 pinouts, the COM Express module family offers six PCI Express x 1 channels and a PCI Express graphics (PEG) x 8 interface. In addition, all modules feature four USB 3.0 and four USB 2.0 ports, LPC, Gbit Ethernet, and HD audio. In addition, up to four SATA interfaces at up to 300 MB/s are available. With DisplayPort and HDMI interfaces (3x digital display interface) with resolutions of up to 4096 x 2160 (DP) and 1920 x 1200 (HDMI), along with LCD and VGA interfaces, the MSC C6C-A7 modules offer comprehensive display support. The high-performance platform MSC C6C-A7 runs under the Microsoft Windows® Embedded Standard 7 operating system, as well as Linux. The UEFI firmware from AMI is used as BIOS. In addition to the embedded modules, MSC offers a corresponding Starter Kit and carrier boards, as well as cooling solutions and memory modules. Product samples will be available by end of January. The cost-optimized module is around US $290.00 in volume orders.